Galapagos Islands are not only one of the world's most desired destinations. It is also a place which will make you think differently about planet Earth, about the fragility of flora and fauna and about us, humans, who have had the biggest and not always the most positive impact on this delicate ecosystem. Not every time tourism and sustainability go hand in hand, and when traveling to the Galapagos Islands, we wanted to be sure that we will be on a cruise who supports the sustainable tourism altogether with same-minded people who really care about nature and who are not there only to tick off another place from their must-see list. Galapagos Islands attract those, who are magnetized by nature in its raw form and those who want to get closer to the magnificent place which inspired Charles Darwin to lay the foundations for his revolutionary evolution theory and the theory of natural selection. It can be overwhelming to choose the right company and vessel for the ultimate Galapagos experience. Not only for most of us it is the place we will visit only once in our lives, but also the price is not insignificant, and everyone wants to make the correct choice and get the unforgettable experience. 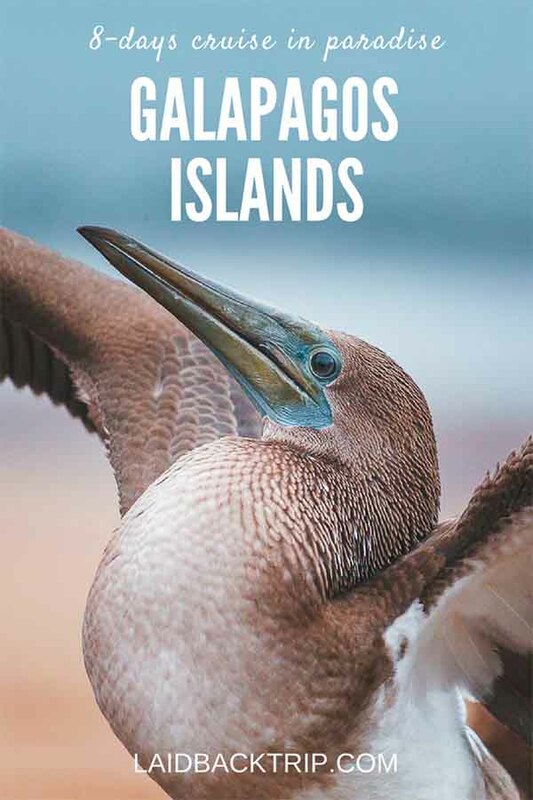 Visiting the Galapagos Islands is unique in many ways therefore people very often choose it as a destination, where they can celebrate extraordinary occasions in their lives such as honeymoons or anniversaries. We also gave it to ourselves as a gift - Martin turned 30 this January, I will have my 30th (whispering) birthday next March, and the third reason was, that this year, we celebrated ten years as a couple. We've put all this together also we've been in South America at that time, and the conclusion was straightforward - we had to visit the Galapagos Islands. Because of all the factors mentioned above, we decided to experience a one week cruise around the Galapagos archipelago with Ecoventura on their first-class yacht M/Y Eric. No wonder our expectations were higher than usual and maybe because the Galapagos Islands were always our dream destination, we were also a bit concerned that we might return to the mainland of Ecuador disappointed. But our trip with Ecoventura was in one word wonderful, and we are not afraid to say that this trip brought our traveling experience to another level. The perfect service of Eric's crew made us forget about our everyday life, and we could focus only on exploring the islands on our itinerary and meeting their unique inhabitants who live on the land and underwater: birds who are fearless of humans, playful sea lions, ancient tortoises, motionless iguanas, cute small penguins and many more. The Galapagos National Park is Ecuador's first national park, established in 1959. Since then, the park management works hard to balance human actions and the fragile flora and fauna on the islands. It is not always easy. Not only the Galapagos Islands gained worldwide popularity, and it is one of the most desired destinations. There are other threats such as introduced animals and plants which can be brought to the Galapagos Islands by locals although most of the time in good faith. There are two ways the National Park tries to protect the Galapagos nature and animals. The first way is to educate local people and explain to them why and how some of their actions can damage the stability of the archipelago, and ruin the long-run projects. That is why, cruises, when not full have an obligation to invite Ecuadorians on board. This way they can learn and fully understand the effort of the Galapagos National Park and also appreciate the extraordinary environment they live in. The other way how to protect the archipelago is to set strict rules for tour operators and limit the number of visitors. In practice, it means that first of all it is much harder to get the license, but also the tour operators have a strict schedule they must follow, so it ensures that there are not many people at one time at the same place. Also, every boat even the one-day trip boat must have a naturalist guide on board who serves as an ear and eye of the national park. For now, the situation seems stable, it is even slowly getting better at some islands, and we hope that all the effort put into the protection of this incredibly beautiful piece of the planet Earth will be successful. A good example can be a successful breeding program to bring back tortoises to the wildlife. Humans decimated the population of tortoises after they arrived in the archipelago in the mid-19th century, killed them for meat and destroyed their natural habitat. Charles Darwin Research Station now runs a captive breeding program with great success, but it will take decades to fix the damage that humans have caused. Probably the main reason for everyone to visit the Galapagos are the animals. If you are worried, you won't see them, relax. Animals in the Galapagos were the same we imagined them. Majestic, completely fearless of us, ancient and absolutely magnificent. The only thing you should consider is the season when to travel to the Galapagos Islands. If you have preferences of seeing wildlife in a particular stage of the cycle, then you should choose carefully, but overall we believe that every season has something to offer in some way. For example in mid-September, we witnessed sea lions while having young ones. Sometimes we arrived at a place where we could see newborns only a few hours old - moments we will never forget. Although nowadays almost every destination tries to persuade travelers that they can visit it all year round, not everytime it is 100% true. But if there is a destination you can visit anytime, it is the Galapagos Islands as there is no best and worst time. The year is divided into two main seasons - wet and dry. The wet season lasts from December to June. The air is warm the sea is warm and calm, skies are usually clear, except for short afternoon rainfalls. The dry season from July to November has a bit colder temperatures during the day, the sea temperature is refreshing (put it mildly), and waters are rougher (you can prevent the first one by using a wetsuit and the other one with seasickness pills). It can be slightly overcast or misty (the local term for the mist is garua) on the mainland, but overall it doesn't rain. Throughout a year, you can see a different kind of animals in various stages, and it is only up to you if you prefer to watch the mating rituals, nesting season, admire newborn babies, or watch specific wildlife. The sea can be rougher during the dry season, but some people might be more prone to seasickness than others no matter the season. It is possible that from July to November you can feel the choppy ride, so don't forget to bring seasickness pills (there were pills available for free on Eric yacht) or anything that's working for you - nausea chewing gums, oils or sticking plasters. We felt seasick one afternoon and the seasickness pills altogether with the afternoon activity on land helped a lot. When it comes to planning your ultimate Galapagos adventure, you will be faced with the most difficult decision - to take a multi-day cruise and live aboard or be based on the mainland and take one-day trips. To be honest, at the beginning we also considered to stay on the islands and take day trips from there. This option should be cheaper (but still definitely not budget-friendly), but the biggest downside for us was limited sites we could have visited in a day, and also traveling times were longer. Now we know, that during the day on a cruise we had time to visit up to three sites per day and do up to five activities while on a day trip we wouldn't have seen that much for sure. There are also places where it is not even possible to visit on a one day trip. A great example would be one of the most pristine and well-preserved islands of Genovesa. Only to get there, you must be a part of a multi-day cruise (at least 3-4 days) that includes Genovesa. Also, the tourism activities within Galapagos National Park are strictly monitored and day ships altogether with cruises have assigned hours when they can visit the site. But when day trippers must leave, people on a boat can relax on the sundeck and enjoy the scenery much longer as the navigation usually take place overnight. Mentioning all the reasons which brought us to the final conclusion to take a boat tour and travel on M/Y Eric with Ecoventura, we also completely understand those who prefer their freedom and don't want to be part of any group with a fixed itinerary. Those travelers still can go for a one-day tour and travel on own, but after having such a wonderful experience, we strongly recommend taking a cruise this time. What we found almost the most important during our cruise were our knowledgeable guides and our relationship with them. Ecoventura even has a rule that for every ten passengers there must be at least one guide. It made a huge difference when we could spend time with them during our activities but also on the boat as we could anytime ask them as many questions we wanted. Unlike on big cruises where guides cannot spend time with travelers during their free time or during meals but only at times during activities. We are not afraid to say that our relationship with our guides was more intense and friendly thanks to the time we could spend with them. An exceptional guide and a good relationship with him or her is key for a successful trip, because the rules in the Galapagos Islands are strict and you cannot walk on own or wander off the designated paths, therefore, you will spend a lot of time with your guide - so it is better to be with a specialized and enthusiastic one who loves his job and is well-paid for it. Also, guides on first-class yachts must have a certain degree of education and must be well-experienced. They also speak English fluently and are well-knowledged - and there are lots of exciting things to learn! The most of cruises take five or eight days, some people combine both itineraries and spend on the boat ten or up to sixteen days. Mind you, that on our itinerary A cruise, we explored mainly the south-east and central part of the Galapagos, to travel to the north and west, you need to take itinerary B tour as well. To explore every corner of the Galapagos Islands, you need to combine both routes, as only this option will take you through the archipelago. We found eight days as an ideal time to spend on board. We were every day excited to see new places and animals, and it felt like the right length for us. Five days might be too short considering that the first and last day are only half days because of the transport, but it is an option for those with limited time. But if you want to get the most of the Galapagos and experience ultimate trip, go for the 16-day cruise. Some people might be a bit worried that they will have to do something they don't like because it is on the itinerary, but the opposite is true. If you don't want to go on a walk and want to relax on the sundeck or read a book in your room instead, you can stay and join the group once ready for an activity. If you are not a swimmer or snorkeling is just not your thing, there is no pressure that you must jump into the water. You can either wait until the activity ends (approximately one hour), or there is sometimes an option to go with another guide and explore the wildlife during the panga tour. Activities we could do during our eight days were kayaking, paddle boarding, snorkeling, panga wildlife watching tours along the shore or walking on the islands. The itinerary was pretty busy and after we felt quite tired so it came handy to have a small lounge and sundeck where we could relax and hang out with our fellow travelers and watch amazing sunsets. Those, who have enough energy and courage, can jump off the upper deck with the captain's help. It is possible only at certain places when the boat is anchored and when the conditions are perfectly safe. Galapagos Islands are a very fragile environment which still balances between sustainability and desire of thousands of travelers to visit this destination. Nowadays the number of visitors is limited by Galapagos National Park, and it is not allowed to build new hotels or start new cruise business (this decision should last at least for the next ten years). When we collaborate with companies, it is extremely vital for us to know that they care about the environment and they try to set an example for others how to run a business with the focus on sustainability. Ecoventura is a pioneer in environment conservation and cooperates with many projects such as the Charles Darwin Foundation, and also on yachts use biodegradable soaps, solar panels or filtered water. When cruising the Galapagos archipelago, there are principally two itineraries you can choose from - itinerary A: East & Southern Route, and itinerary B: West & Northern Route. What we understood, there is not a big difference in terms of the wildlife as both itineraries ensure visitors will spot the most significant animals the Galapagos has to offer, the only difference is, that the itinerary B cruise more around lava islands and doesn't see that much greenery as itinerary A and there are also longer distances between islands, but as the navigation usually takes place at night, it shouldn't be a problem. When it comes to food, we can guarantee you one thing - you won't be starving on Eric Yacht. Breakfast and lunch are served buffet style while dinner is a plated four-course menu with Ecuadorian and International specialties. For dinner, you can always choose between two main courses one is usually seafood. Also, after morning and afternoon activities, there's a small snack which makes it impossible to be hungry during the time on board. If you have any allergies or food restrictions (if you are vegan or vegetarian), just let the kitchen know, they are happy to prepare food separately. Filtered water is available 24/7 along with tea or coffee. Also, fresh natural juices during breakfast and along with snacks go without saying. You can order as many beers and house wines during dinner at no additional charge. When it came to service, the cruise staff always went the extra mile. We can't forget to mention the exclusive Galapagos chocolate we always found on our pillow before going to bed. One evening was more special than others, as we were invited to have dinner with the captain of the M/Y Eric. First of all, it was interesting to get to know him better and also to learn about the boat navigation, the Galapagos archipelago, and we also heard some funny stories. There are ten cabins (doubles or twins) on Eric Yacht, and the maximum of guests is 20. We found this group size just perfect as we got personal service, yet there were enough people we could talk to and share our everyday experiences. Cabins are not somehow large (don't forget you are still on a boat), but we found our room size comfortable enough, as we could easily store all our luggage in the wardrobe or to compartments above or below our bed. Private bathroom with hot and cold water, shower, toilet, mirror, and a hairdryer is standard. Our room was spotlessly clean, no wonder when we had housekeeping four times a day - we wouldn't need it that often though. Towels, soap, shampoo, and conditioner are available in the cabin so no need to bring it with you. In the next part of the article, we will walk you through day-by-day itinerary A. After we got to know our boat and unpacked our stuff, we had a safety drill to ensure that everyone knows what to do in case of an emergency. Our first activity started at 4 PM, and we headed back on a panga to the San Cristobal jetty, where the bus was already waiting for us. The bus ride took only about 20 minutes, and our destination was El Junco Lagoon, the only source of fresh water in the Galapagos Islands. San Cristobal Island did not welcome us with the best weather as it was raining on the mainland (but locals and scientist would tell you it wasn't raining, it was only a mist - garua). Although we couldn't see the lagoon well, we at least received thorough information from our guides about the vegetation along the trail and overall about the San Cristobal Island. Later we were dropped off in the village and had about a half an hour of free time in the San Cristobal. To be honest, we spent the whole 30 minutes watching a sea lion colony on the shore and did not walk through the village at all. Back on the boat, we had a briefing about the next day (this happens every day before dinner), had a welcome drink with the whole crew who accompanied us for our week in paradise and after, we had our first, delicious dinner on board. We did not travel far during the night (about 3 hours) as we were about to explore the western and northern part of the San Cristobal island. Right after breakfast, when we had a perfect view of Kicker Rock, we had time to fit wetsuits and snorkeling gear which will be ours for the next week (you can bring your equipment as well). The first area to explore that morning was near Cerro Brujo. First, we could choose if we want to kayak or take a panga ride around a towering rock which is a home for several bird species (who flew literally above our heads), crabs and even seals. The current was on our side and kayaking was not hard at all, so instead of hard work, we could've enjoyed the scenery. Then we arrived at Cerro Brujo beach, one of the most beautiful beaches in the Galapagos archipelago with incredibly fine sand. We walked along the beach which was full of sea lions, the sea had turquoise color, and once we finished the walk, we quickly changed into wetsuits and started snorkeling off the beach. Later we got back on the boat, had a snack and lunch. The sea was choppy that day, and we both felt seasick later, so we couldn't wait to start doing the afternoon activity. Luckily, we spent the afternoon at the place called Punta Pitt. The roundtrip trail on Punta Pitt is about 2 miles long and leads through a unique form of natural erosion. The walk took us approximately 3 hours, but only because there was so much to see. This place is known for observing all three species of boobies found on the Galapagos Islands: red-footed boobies, blue-footed boobies, and Nazca boobies. We were lucky to spot all of them that afternoon. Because the visit to the Galapagos Islands is not only about taking pictures but also about education, our guide provided us with an enthusiastic explanation about all specious of birds we've seen, about their nesting and parenting habits as well as about the reason why their feet turn red or blue. We won't tell you why - go and explore the Galapagos on own :-). After we finished the trail, we jumped on a panga which took us to Eric, where we waited for dinner on the sundeck while observing birds who followed us. The third day was all about the unpopulated island, Espanola. In the morning we disembarked at one of the oldest and flattest islands in the archipelago and went inland for about an hour and a half. The trail led on the rocky path, and we could see up close marine iguanas, and many birds such as blue-footed boobies, the Galapagos hawk, and especially the Galapagos Waved Albatrosses who have the nesting place on Espanola Island - this is the largest and only population of the world. Once we reached a viewpoint Suarez Point from where we could see a blowhole spraying the salt water, we had a little break and walked the same way back. In the afternoon we did snorkeling from panga at Osborn Islet along the rock in deep water. We all felt quite cold as the water was refreshing but playful sea lions made it up for us as it was amazing to swim with them, especially with the young ones who fearlessly swam around us. The last stop of the day was Gardner Bay, a place where we did kayaking and later visited a long beautiful beach where we could walk as we pleased. The best thing about traveling by boat is that you will every day wake up in a new place. In the morning we disembarked on Cormorant Point and were very lucky to see many flamingos in the lagoon. The mid-September was a breeding season, so there were also many young ones who don't have the typical reddish color yet. The effect of flamingo's silhouettes reflecting in the lagoon was eye-catching. Then we walked a short trail to the other side of the island via a viewpoint where we could see the lagoon from above and lava field. On the other side is a beach, and we were able to see sting rays close to the shore. When we came back on the boat, we quickly changed into wetsuits while the captain was navigating Eric to Champion Islet, an awesome place for snorkeling along the reef with a deep drop. Except for colorful fish, we swam with sea lions and turtles here. In the afternoon we went kayaking (paddle board is always an alternative) to Baroness Lookout bay. This kayaking was different as it wasn't on the open sea. The bay was quite shallow at some places, and it was relatively easy to paddle. A large number of turtles swam beneath us or were hiding in mangroves. Right after we went to the Post Office Bay, a traditional place from where the first settlers were sending their letters home. This tradition survived until today. You can place a postcard in the box without a stamp, only with an address (you can send it even to yourself). Then you read all the mail in the box, check addresses and pick letters you can deliver by hand (usually near the place you live or visit often). We took one postcard as well and hope we will be able to deliver it one day. Also, our parents might get a visit one day from people who have been to the Galapagos Islands. Anyway, this activity was fun, and right after we went snorkeling from the beach. The Post Office Bay is famous for giant turtles, we've never seen such huge turtles in the water before! Later after dinner, we had an unexpected party as one couple traveling with us was on honeymoon and the crew made a special cake and dancing session for them. We all danced, some more voluntarily than others, but it was fun. But we must say, that the captain knows how to party! The fifth day can be in short called a tortoises day. We spent our morning and afternoon activity on Santa Cruz Island, near Puerto Ayora. In the morning, a panga took us to the port and here we jumped on a bus which took us to Los Gemelos, also known as Twin Sinkholes. Two large sinkholes, a very short distance from each other, literally just across the road, boast with lush green vegetation which also attracts many birds. Another stop was El Chato, a reserve where it is possible to see giant tortoises in the wild. We could walk in the sanctuary as we pleased and could look for tortoises who were everywhere around. There is also a short lava tunnel in the reserve where we were allowed to go. In the afternoon we visited Charles Darwin Research Center a place which probably cannot be missed by anyone visiting the Galapagos Islands. Except for other activities, the research center runs very successful tortoise breeding program which helps to raise a number of tortoises on the islands. All tortoises are released to nature before they turn four years old. In the center is also a relatively new memorial of Lonesome George, the most famous tortoise in the Galapagos Islands. After the visit to the research center, we had free time in the town to buy some souvenirs, but we spent our time entirely on the fish market. Fishermen just arrived and started to clean and cut fish, and the incredible number of birds flew around trying to steal some food from them. During the night we navigated to the northern tip of Santa Cruz. We got off on Bachas Beach where we had a short walk while our guide explained to us why Santa Cruz and this beach, in particular, is a significant place for nesting of green turtles. Then we reached a small lagoon with brackish water, but this time we were not lucky with the spotting of flamingos. But the Galapagos probably wanted to make it up for us and sent a large group of blue-footed boobies to hunt for fish near a place we were standing - the group hunted by dive-bombing. Later we could snorkel off the beach, and those who didn't want to could walk further along the sandy strip. During lunch, we navigated closer to Santiago Island. We started the afternoon with deep water snorkeling, and although all snorkel sessions were amazing, this one was the most exciting as we saw two sharks (some were more excited than others though, right Martin). Later in the afternoon, we climbed almost 400 steps to probably the most scenic and the most photographed place in the Galapagos Islands, the Bartolome Island viewpoint. It is a volcanic island with harsh conditions, but the climb is well worth it as you can see how the slope of lava covered with vegetation slowly descends into the water with the Pinnacle Rock in the background. When we got back on pangas, we sailed along the shore and successfully looked for the Galapagos penguins, the second smallest penguin species in the world. We don't have to mention how cute they are. We spent the morning of our last full day in the Galapagos Islands on South Plazas Island. Despite its small size, the island is home to a large number of animals such as different species of birds or land iguanas who coexist here in this harsh environment where the majority of flora consists of cacti trees and sesuvium plant which changes color depending on the season. The contrast of cacti trees and red plants was photogenic enough, but add statue-like iguanas, and you'll get an extraordinary, Galapagos-like walk. In the afternoon, there was time for our last snorkeling, but unfortunately, the visibility wasn't the best this time because of strong sea currents and sandy seabed. It was also the only place where we could see the Galapagos garden eels. In the afternoon we explored the North Seymour Island, a place with a high chance to spot blue-footed boobies and frigate birds. We were lucky enough to see frigate birds during the breeding season. During this time, males inflate a red throat sack to attract females. Although it was our seventh day in the Galapagos Islands, we still couldn't believe how those birds don't fly away but mind their business, absolutely undisturbed by our presence. As it was our last evening on the boat, we felt a bit sad. Most of us sat on the sundeck and watched the last sunrays of the day. The Galapagos probably wanted to say us goodbye in the best way they could, as it was the most beautiful sunset we've had for the duration of our cruise. Before dinner, we had a goodbye drink with the entire crew which was great as we could thank them properly for everything they've done for us. We went to bed pretty early that evening as everyone was a bit concerned about the choppy sea and the eight hours long navigation to San Cristobal Island. Our morning task was to pack, have breakfast and get on a panga which took us to the mainland of San Cristobal. Sunday is the busiest day for Ecoventura tour because it is departure and arrival day, but everything went smoothly and efficiently. Before our flight, the bus took us to the San Cristobal Interpretation Center a small indoor museum explaining the creation of the islands, reasons of the uniqueness of the local flora and fauna and there was also a section dedicated to the history of colonization on the islands. It was a nice sum up of knowledge we gained during the whole week, and we could also read about nowadays situation and the impact of tourism on nature and also about the importance of putting the sustainable tourism into practice. After, we had about an hour in San Cristobal, and then the bus took us to the airport, where our guides checked us in, gave us our boarding passed and here, our ways split, and we carried on to Quito and back to our ordinary lives. This tour happened to be far beyond our expectations. If I can speak only for us, we usually don't need much. The most important for us is to visit a place and gain new experience. The service, food, and accommodation usually don't worry us that much. The Galapagos Islands were special in many ways, and we could appreciate great service we were provided by our crew members along with a comfortable cabin and tasteful food. For most of us, visiting the Galapagos Islands was once in a lifetime thing, and now we understand why it comes with all-inclusive service. The itinerary is pretty busy in order to see the most of the archipelago and all of us were quite tired every evening. It was a time when we fully appreciated the excellent (and) hard work of our crew and the reality that we did not have to care about logistics because everything was set. Overall, we cannot even express by words how much we enjoyed our time in the Galapagos Islands with Ecoventura and hope, one day we will come back. For more information about cruises, check the Ecoventura website. To make a reservation or ask any question you have, fill out this contact form or contact them directly via email. This post was written in collaboration with Ecoventura. As always, all opinions are our own. Are you visiting Ecuador soon? By clicking and making a reservation via our affiliate link you support us as we will earn a small commission at no additional cost to you, and it helps us keep our blog running.